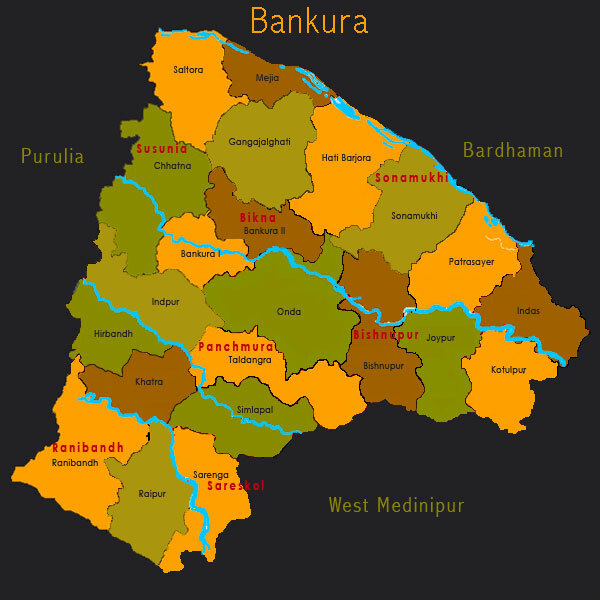 Bankura, part of the Bardhaman Division, is located in the western region of West Bengal. The districts of Bardhaman, Purulia and Paschim (West) Medinipur lie to its north, west, and south, respectively. Bankura district is part of the ancient Rarh region (the word ‘rarh’ is thought to mean ‘land of red soil’ or ‘land of laterite’) and was once inhabited by Proto-Austroloid and Dravidian tribes who were subsequently assimilated with the people and culture of post Vedic times. Cultural traces of all these groups are visible in Bankura district to the present day. The tribals and sub groups in Bankura, many of whom were initially martial races at some point of history, are substantial in number. Around three-fourths of West Bengal’s Santals live in the Rarh region. The area in and around present day Bishnupur in Bankura district, was the capital of the Malla kings for almost a thousand years, from the seventh century CE till the advent of British rule. It was then called Mallabhum with Vaishnavism being the dominant influence of the region. Prior to the conversion to Vaishnavism of the Malla king Bir Hambir however, the region was widely influenced by Jainism, Buddhism and Shaivite thinking. However, the history of Bankura is the history of the rise and fall of the Hindu Malla kings of Bishnupur, The Muslim conquest of Bengal did not affect the Bishnupur princes and they continued to rule, undisturbed. The Malla kings occupy a place of distinction not only for their military prowess but also for their patronage of distinctive styles of arts, architecture, sculpture, and music. During the Malla reign, Bishnupur became one of the principal centres of culture in Bengal. It is said that the card game of Dashabatar was borrowed from the Mughals and introduced to Bishnupur during the reign of Bir Hambir as a game of recreation for the Malla kings. Most of the terracotta temples for which the region is famous were built during the Malla rule and the brilliant and detailed terracotta work on these have withstood the ravages of time. Bishnupur was ceded to the British with the rest of Bardhaman in 1760. In 1787 it was united with Birbhum to form a separate administrative unit, only to be transferred again to the Bardhaman collectorate in 1793. In 1881 it became a separate district and continues as such, till the present day. Its glorious cultural heritage notwithstanding, Bankura district is economically underdeveloped. Though a vast area of the district is not cultivable due to undulation of land and morum soil, agriculture still accounts for almost 70% of its income. However, 80% of the farmers are small and marginal. Forestry contributes to the income of the district, but due to deforestation, forest resources are also dwindling. According to the 2011 Census, Bankura district has a total population of 3,596,292; 91.61% of which lives in the rural areas. Bengali and its local dialect is the principal language used here, though tribal languages like Santali are also widely used. Christian missionaries were active in Bankura from the mid-eighteenth century, founding schools, colleges and charitable institutions in the district leaving their own mark, especially on the ‘backward’ sections of this region. Other than its temples, Bankura is also famous for its clay pottery. The exquisite craftsmanship of the terracotta artisans of yore continues among the potters of Panchmura, Sonamukhi and some other small villages who create quality terracotta tiles, the ubiquitous Bankura horse and many votive objects including figures of horses, elephants and tigers. Thousands of votive objects for the worship of the folk goddess Manasha are also turned out – in the form of the elaborately crafted pitchers symbolising Manasha, the Manasha Chali and the simpler Manasha Ghot. The Bankura horse has become symbolic of craftsmanship and has inspired the symbol of a government handicrafts marketing corporation. Due to the popularity of the terracotta horse, terracotta horses and elephants are being replicated in wood. Since about 1965, craftsmen have carved out the horse in wood to cater to tourist demand. Small terracotta horses and elephants are given in a symbolic sacrifice to many of the local deities, but the phenomenon of a whole assembly of terracotta horses and elephants in assorted sizes and shapes being placed around the idol is a sight peculiar to Dharmathakur worshipped here as one of the village deities mainly by the Dom community. One of the most expensive saris in India called the Baluchari is created by craftsmen of Bishnupur. Two hundred years ago Baluchari used to be woven in a small village called Baluchar in Murshidabad district, but this flourishing trend later declined, especially during British rule, and most of the weavers were compelled to give up the profession. 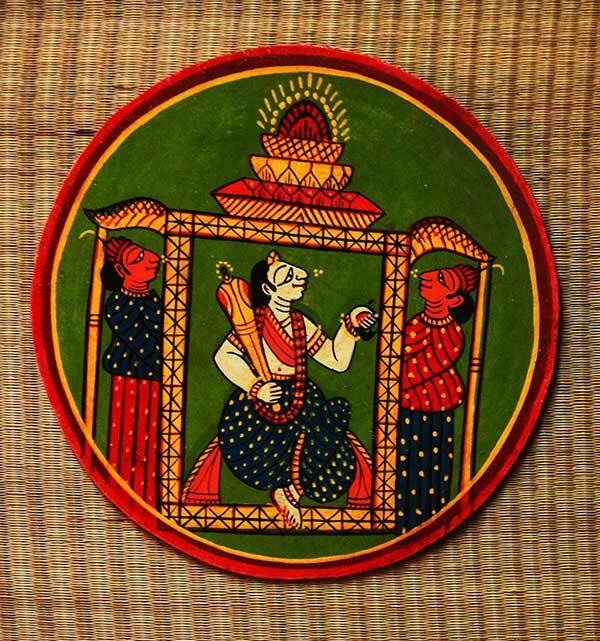 In the first half of the twentieth century, thanks to the intervention of artist Subho Thakur, the rich tradition was revived though modified, and relocated to Bishnupur which was always famous for its silk. The influence of the ornate Bishnupur terracotta temples can be seen in Baluchari saris. 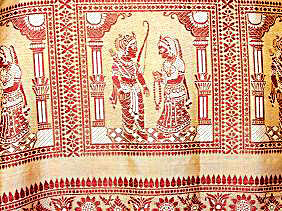 Mythological stories taken from the walls of temples and woven on Baluchari saris are a common feature. 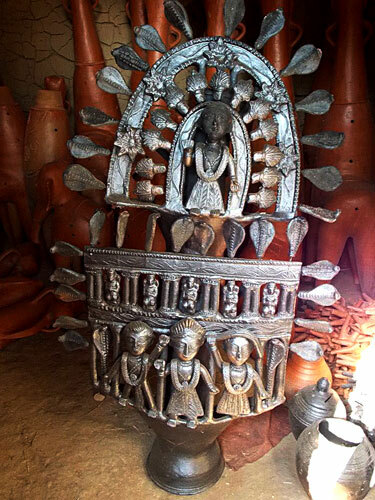 Among other traditional folk crafts prevalent in Bankura are Dokra metal casted sculpture; utensils from bell metal, an alloy of copper, considered one of the oldest crafts in Bengal; the Bel-mala, an age-old craft of making garlands from the wood-apple shell, for religious and ornamental purposes; conch shell carving; and lantern-making that also began in the Malla period, and that is still used by the villagers in Bankura, for practical as well as decorative purposes. Dashabatar cards, though no longer played as a game, are made as decoration pieces. Stone carving in West Bengal is primarily practiced in the Susunia Hills of Bankura district. The easy availability of raw materials from the quarry in the hills has long facilitated this craft. Stone carving artisans have now come up with varieties of carved products in addition to their traditional stone utensils. However, the stone carvers now face a grave challenge as the state government has imposed a ban on quarrying in the hills. Unfortunately, traditional metal craftsmanship runs the risk of extinction with changing consumer habits and the prohibitive cost of metal crafts compared to the commercially produced items for similar use. In fact many brass and bell metal artisans have switched to stone carving. The common people belonging to the lower strata of society sing different types of Jhumur songs and dance to them at various times of the year, while tribal villages come alive to performances of ritual, songs and dances like Korom, Pnaata Naach and much else during their festivals. A tribal cultural festival under the name of Kherwal Tukou is held every year at Siulibona village. It is today a great cultural event of the Santals. Fairs and festivals take place throughout the year. The government-organised Bishnupur Mela is held in December every year, while religious-festival-centric fairs include the Ras Utsav of Bishnupur, the Chaitra Gajan of Ekteshwar, Dharmarajer Gajan of Beliatore, Kaliyadaman of Jagdallah and Purandarpur, Pirer Utsav in Indas, Basuli Mela of Chatna and the Dhara Utsav of Susunia. Bhadu and Tusu songs are sung during the festivals of the same name celebrated by the women. The Shiva Gajans (Shiber Gajon) are festivals held in the Bengali month of Chaitra (March-April) associated with the worship of Lord Shiva. These are often the scene of various types of self-immolation. Charak or swinging by rope fixing an iron hook to the body was a common feature throughout Bankura district in connection with this festival. This has now been prohibited but fire walking is still observed at certain places. The Jhapan festival is dedicated to the snake goddess Manasha on the last day of Sravan (July-August). Songs in praise of Manasha or Manasha Bhashaan are sung during the month long worship of the snake goddess, while snake charmers display their prowess.